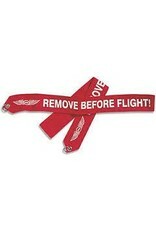 High visibility red streamer that can be fastened to anything that needs removing before flight. A bright red heavy nylon banner that can be fastened to anything that needs removing before flight. Comes with a grommet and wire ring that can be attached to everything from gear pins to gust locks and pitot covers. Heavy duty vinyl is tear resistant.